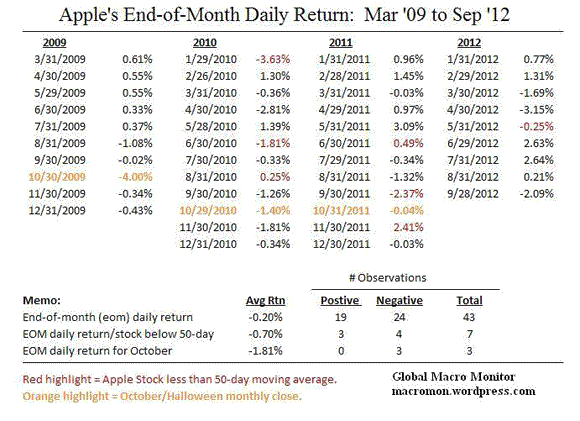 Interesting data on Apple’s end-of-month (eom) daily returns since the March 2009 crash bottom. Our priors are that every PM and their mother would be buying Apple (AAPL) at the end the month to show they own it as the stock has returned a stunning 477 percent since March 31, 2009. Of the 43 eom observations since March 2009, the stock has traded down 24 days and up only 19 with an average return of -0.20 percent. Controlling for when the stock is trading below its 50-day moving average, as it now is, Apple has been down 4 out of the 7 observations for an average return of -0.70 percent. The stock has closed lower each of the last trading days in October for past three years. Also interesting the negative daily eom returns tend to run in streaks. That is, negative daily eom closes usually follow another. Will this be the case today? Wish it were that easy. Unfortunately, we don’t have data points to control for a 2-day stock market closure due to weather and for such a huge management shake-up which took place yesterday. It’s hard to see any positive catalyst for the stock in the near term x/ a trading bounce and consolidation after the 15 percent sell-off. Apple, in our opinion, needs to prove it hasn’t jumped the shark with the iPad mini by coming out with a new innovative product to show the spirit of Steve Jobs still is alive and well at the Curperino HQ. Going to be an interesting trading day today. Stay tuned. What’s Next for Apple (AAPL)?